﻿ [VIDEO] Stop the Drama. Do the Work. [VIDEO] Stop the Drama. Do the Work. 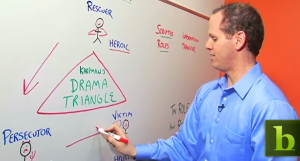 Is there too much drama in your workplace? Drama starts from a simple recipe first defined by Karpmann: A persecutor, a victim, and a rescuer. Learn to identify the roles, and stop the drama before it starts. Get back to doing useful work! A favorite at Ed Muzio’s keynotes and information sessions — you can view this fast-paced 5-minute video now.